Our company offers a wide quality range of Locking Capping Machine includes capping machine and automatic capping machine to our clients. 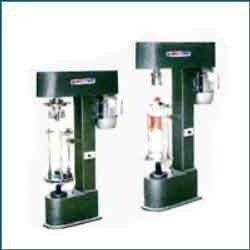 These machines are checked on various parameters to ensure flawless production. Manufactured using advanced technologies, these are offered at reasonable prices. Our range also comprise of Locking Capping Machine. 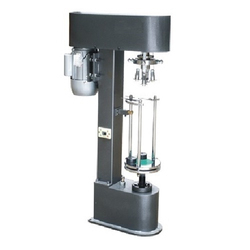 It uses the latest technology to accurately torque most cap types onto a wide range of bottles. Utilizing VF drives and intelligent torque control, it can torque flat caps, flip top caps, pull spouts, safety caps, child proof caps, sport caps, trigger pumps, and closures with over-caps or induction seals at speeds up to 200 cpm*. Cantering bottle grippers allow these spindle cappers to accomodate almost any bottle type or shape including PET, PP, PVC, HDPE, LDPE, and Glass. Each machine also features spring loaded spindles to reduce damage to caps and lower the overall disk wear. Locking Capping Machine offered by us is manufactured using best available techniques and under the firm direction of experienced quality controllers. Available in the net weight of 65kg, these are fabricated using modern and latest technologies. The operation type of this machine is electric and it has a cap of plastic and metal type. Locking Capping Machine is widely used in chemical industry electronic industry building materials home appliances papermaking foodstuff & drink etc. 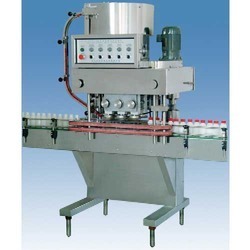 Being a quality oriented organization, we are involved in providing supreme quality range of Linear Capping Machine. It uses the modern technology to exactly torque nearly all cap types onto a broad range of bottles. Utilizing VF drives and bright torque control, it can torque flat caps, flip top caps, pull spouts, safety caps, child proof caps, sport caps, trigger pumps, and closures with over-caps or induction seals at speeds up to 200 cpm. Cantering bottle grippers permit this spindle capper to accommodate approximately any bottle kind or shape counting PET, PP, PVC, HDPE, LDPE, and Glass. Each machine also characterize spring loaded spindles to decrease harm to caps and lower the generally disk wear. We are offering our clients with a wide range of Locking Capping Machineto our clients. Available in the net weight of 65kg, these are fabricated using advanced and innovative technologies. The operation type of these machines is electric and they have a cap of plastic and metal type. We also offer personalized services to our clients at reasonable prices.